Tickets $25 / $15 Previews (2/28-3/31). Like the absinthe that inspired it, The Ruse of Medusa is an acquired taste. There is nothing like it onstage anywhere else in Chicago. When you enter the Chopin Theatre for The Ruse of Medusa, it may sound like a half-dozen wild monkeys are performing a musical cacophony on piano, strings, and horns because they are. Settle in for an hour of wild antics, visual and aural stimulation, screaming (both human and monkey), and total silliness. Written by Erik Satie in 1913, this lyrical comedy is one of the first plays to contain absurdist and surreal elements predating the start of dadaism. As is to be expected from an artist who referred to himself as a phonometrician ("someone who measures sounds") and drank himself to death with absinthe, do not presume a straightforward plot in Satie's work. The story loosely follows Baron Medusa, a farcical eccentric egomaniac; his valet, Polycarpe; foster daughter, Frisette; her suitor, Alstolpho; and Jonas, a mechanical monkey. It occasionally touches on political and labor issues involving unions, which may or may not be relevant to anything. Originally performed in private French salons, The Ruse of Medusa got its most famous production at Black Mountain College in 1948, where it featured an interdisciplinary dream team including architect and inventor Buckminster Fuller as the Baron and dancer- choreographer Merce Cunningham as Jonas, with Arthur Penn directing and decor by artist Willem de Kooning. Those are awfully big shoes to fill, and Dado, who directs this Facility Theatre production, does an admirable job staging this difficult and bizarre production. Dado decided to gender-swap the roles, which enhances Satie's script and makes for some interesting dynamics. Wonderfully expressive and over-the-top, veteran drag performer David Cerda is in his element as Baron Medusa, complete with outrageous wig and costumes. He relishes breaking the fourth wall, directly engaging the audience. Jenni Hadley is powerfully dynamic as Polycarpe, whose demeanor and costume recall those of the White Rabbit from Alice in Wonderland. A triple threat, she also accompanies the superb small orchestra on violin and absolutely slays in a solo rendition of "MacArthur Park." Laurie Roberts brings hilarious physical timing as Alstolpho, along with salacious accordion skills. Some elements of Medusa work well, like the musical direction by Sam Clapp and the beautifully colorful costumes by Kotryna Hilko. The choreography, also by Roberts, occasionally succeeds, like a silly handshake dance highlighting the awkwardness of social conventions. The overall action would benefit from some well-rehearsed clowning techniques and pantomime to help nail the comic timing. The last 20 minutes bring delightful surprises that directly engage the audience in fun ways that make this surreal sensory show worth experiencing, if for no other reason than the strange joy of witnessing a production unlike anything else playing in Chicago. But beware, much like absinthe, Medusa is an acquired taste. 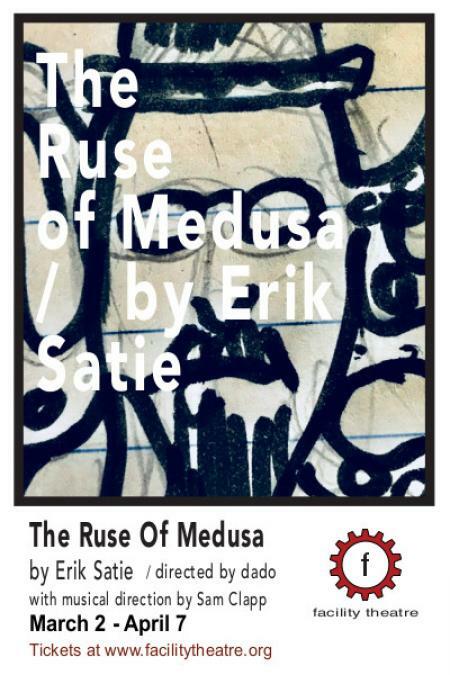 "The Ruse of Medusa," the hour-long play with incidental music and dance authored by Erik Satie in 1913 and running at Facility Theatre, cannot be described, only experienced. The monkey-masked orchestra, the random and repetitive "plot," the almost-but-not-quite-off-the-rails performances by the five-person cast, the sense of being pulled down the rabbit hole of free-form absurdity: it all comes together as a strange and enlivening sensation rather than a coherent thought. Satie-remembered today for his proto-minimalist musical compositions, not his many writings-seems to have penned "Medusa" as a private entertainment to share with friends and performed in salons. He was the ultimate bohemian, working in a shabby garret so cluttered even the pianos were stacked atop each other; even this play has a jumbled-attic feel. Satie viewed the late Romanticism of his day as a symptom of the general decay and did what he could to negate it. "Medusa" came out a few years before the artistic anarchy of the Dada movement took shape in wartime Zurich. But it's in precisely the same spirit: a frontal assault on all that was sacred in art, politics and culture. As far as I know, the play has been staged just once in this country. No modern "Medusa" could hope to match the star power of that 1948 production at Black Mountain College, an experimental school in rural North Carolina that, for a brief and glorious moment, was the hub of the American avant-garde. It featured Buckminster Fuller as the decadent Baron Medusa, Chicago writer Isaac Rosenfeld as Polycarp, his rebellious servant, Elaine de Kooning as Frisette, his timorous daughter, and Merce Cunningham as Jonas, his "costly mechanical monkey." John Cage accompanied on piano, Willem de Kooning designed sets with his wife, and Arthur Penn co-directed. Afterward, the evening spiraled into a bitter dispute about the relative merits of Satie and Beethoven, climaxing in a battle royale between the two factions, with one side armed with crepes suzette and the other with wienerschnitzel. This "Medusa" may not have quite as dramatic an ending but it's engaging in its own right. Director Dado, the veteran Chicago theater presence and resident director of the Facility Theatre, does a masterful job of reviving this rarity, managing to be faithful to both Satie's era and our own. She understands the paradox that a work that breaks the rules must be performed with rigorous discipline, and that effective silliness needs deadpan delivery. The result is a production that is goofy and improvisational but never slack or self-conscious. Dado makes fine use of the dimly lit and baroquely overstuffed Chopin Theatre, with its Gilded Age bordello charm. The theater features multiple performance spaces, allowing the audience-donning Satie-style bowlers and big, round glasses-to be led dancing into a back room. There, this anti-play ends with a perfect anticlimax: a sing-along version of Donna Summers hit version of Jimmy Webb's enigmatic "MacArthur Park," complete with disco ball and pastry treats, after which the players take their bows and the world returns to normal. David Cerda is a wonder as the title count, a monster of unhinged patriarchal authority: large, but light and bouncy, sinister yet ingratiating, he fills the space with the epicene aristocrat's bizarre personality. He is Ubu Roi by way of Dr. Frank-N-Furter and has more fun than the law should allow. Cerda is well matched by Taylor Galloway as his blushing, deep-voiced daughter, Brian Shaw as his fez-topped pet monkey, and Laurie Roberts as the daughter's mustachioed fiancé.